Can people actually 'own' virtual land? 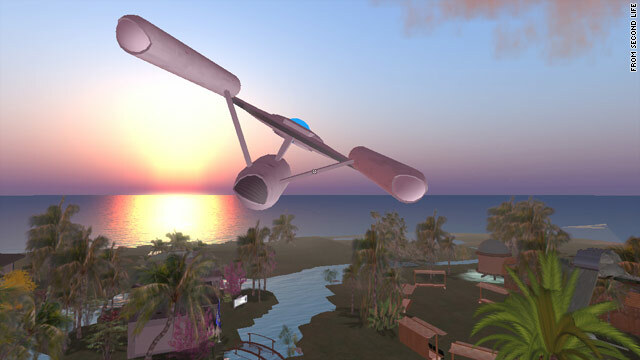 It remains unclear what rights, if any, people have to virtual property, like Zed Drebin's space-themed island in Second Life. (CNN) -- Zed Drebin has a pretty fantastical life. He owns a house on the beach, which he's styled to be part Barbie castle and part medieval lair. In addition, he is the landlord of two island colonies, both of which feature spaceships, amusement parks and all kinds of futuristic buildings. About 80 renters pay to live in themed condos at his getaway resorts. For all of this, Drebin pays only $390 a month, he said. But there's one big flaw in this space-themed paradise: None of it is real. Zed Drebin is an avatar in the virtual world of Second Life. He's controlled by Arthur, a 44-year-old who lives in New York City, and who didn't want his full name used for fear it would hurt his business. Despite the fact that Arthur pays U.S. dollars to "own" virtual land in Second Life, and that his renters also pay him in real money, it's unclear whether he, or any of Second Life's "residents," have lasting rights to these virtual tracts. "We've invested a great deal of money and an even greater amount of time; literally hundreds of people have contributed to creating our regions," he said. Now, in a sign that virtual issues increasingly are bleeding into the real world, some "residents" of Second Life are taking virtual property rights to real-world court, citing California consumer protection laws to make their case. On April 15, four Second Life property owners filed a class-action suit against Linden Lab, the online world's creator, alleging the company misled players into thinking they owned their virtual lands. People pay real dollars to Linden Lab for access to virtual land. The civil suit, which does not directly involve Arthur, was filed in U.S. District Court in Philadelphia, Pennsylvania. Plaintiffs invoke consumer-protection laws in California, specifically, because Linden Lab is based in San Francisco. The complaint says Second Life tried to lure people into the virtual world by promising it would be a unique place where residents actually owned their property. Then the virtual world unfairly changed its rules, the suit says. Linden Lab's rules now say the land is a service the company controls and can cancel. Plaintiffs seek at least $5 million in damages. Linden Lab declined to comment on the pending litigation. Legal experts said the case highlights the fact that our courts haven't caught up the increasingly complex interactions that take place in online worlds. Virtual worlds are somewhat lawless, the experts said. The only government that controls them is the company that created the world. The only constitution that reigns is that company's "Terms of Service" agreement, which users must sign digitally before getting access to the service. "In these worlds, we are somewhere in like the 16th century" in terms of legal systems, said James Grimmelmann, an associate professor New York Law School who focuses on technology and the law. "I'm quite serious. When this stuff started out we were talking pre-feudal -- totally made up on the spot. They made [rules] pretty much in response to individual situations. "But as this stuff got to be big business, the companies realized they had to start getting regular in administering justice. They couldn't be too irregular or people would quit." "Virtual Land is the graphical representation of three-dimensional virtual world space. When you acquire Virtual Land, you obtain a limited license to access and use certain features of the Service associated with Virtual Land stored on our Servers," the agreement says. Some Second Life users don't see it that way. The federal complaint says many users were led to believe that they actually owned their virtual plots of land, on which many players build digital homes and shops that they use for business purposes. Second Life -- a 3-D environment that looks kind of like a video game -- has a real economy based on "Linden Dollars," which can be exchanged for major world currencies on a market system. Andrea Matwyshyn, an assistant professor of legal and business ethics at the Wharton School at the University of Pennsylvania, said real courts have been slow to take up issues associated with these complicated worlds. "The law is a slow-moving elephant, and technology is a graceful gazelle," she said. "And it's a mismatch." Matwyshyn said virtual property should be thought of like a "service" instead of something that's actually owned. But because the issue is so new, the new lawsuit likely will be settled out of court, she said. That happened with a similar case in 2006, she said. Grimmelmann, the law professor, said the virtual land does have real value. It makes people feel happy and at home, the same way looking out at a front yard from a real-world porch would, he said. But he cautioned against over-regulating virtual worlds because that would stem the high levels of creativity they inspire. To be most fair to players, virtual-world politics need to move the way of the real world by enacting democratic systems so players can create the rules they would like to live by online, he said. Arthur, the virtual landlord, said he doesn't make money from his transactions. He runs a nonprofit group in Second Life called United Federation Starfleet, whose goal is to take people on "Star Trek"-themed tours for free, he said. So he's not as fearful of losing his digital property rights as some. He said he knows he could be evicted from his home in Second Life, and he equates his situation to renting a house. But being evicted would be devastating to him, he said, not because he's trying to make money in Second Life, but because he and other people involved with his space-themed group have put so much time into developing their digital land. He trusts Second Life's owners to honor his dedication to the virtual world. "Our expectation is that we wouldn't be sold down the river by Linden Labs," he said.